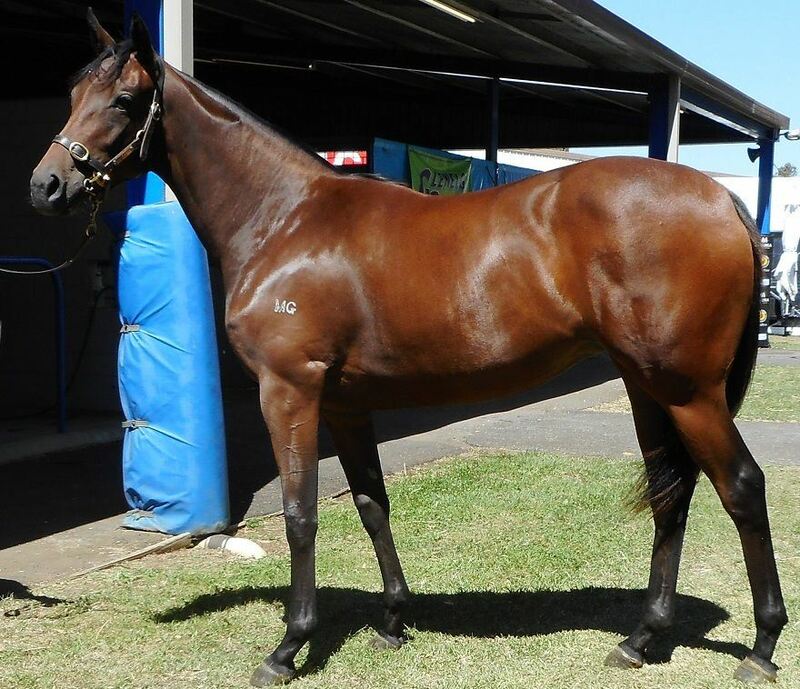 John's Comments - "This filly is by the Group 1 VRC Australian Guineas winner in Wandjina. She is a strong running type filly who has already progressed through a preparation that saw her finish 2nd in a Mornington Jump Out. Has returned to work early April 2019 and would be no surprise to see her at the races mid year"
WANDJINA (AUS) (Bay 2011-Stud 2015). 3 wins–1 at 2–1000 to 1600m, $638,800, £7,088, VRC Australian Guineas, Gr.1, CS Hayes S., Gr.3, 2d ATC All Aged S., Gr.1, 3d MRC Caulfield Guineas, Gr.1. Half-brother to SW Inspiration (Hong Kong Sprint, Gr.1), SW Provence (VRC Desirable H., L) and SW Lucky Unicorn (VRC Chester Manifold S., L). Sire of SP Deep Chill, Grand Scholar and of Hearty Lass, Order of Valour and of the placegetters Bengalla Bay, Bronte, Wandonna, etc. His oldest progeny are 2YOs. Star of Helicon (f by Fusaichi Pegasus (USA)) 3 wins at 1300m, 1400m, A$110,190, ATC TAB Iphone App H., 2d ATC Petersham RSL Club H., Sydney Carnival on Facebook H., 3d ATC Tab.com.au H., Hyland Race Colours H., Michael Ford H., Like Us on Facebook Warwickfarmracecourse H.
Vegapine. Winner at 1100m in 2018-19 in Aust. We are Bomber Fans (f by Encosta de Lago) Placed in Aust. PINEZERO (f Danzero) 4 wins-1 at 2-to 1200m, A$299,950, MVRC Silver Jubilee S., L, MRC Quezette S., L, Express Class H., Johns' Hope H., 2d MVRC Woodstock Classic Oaks, Gr.2, MRC Tranquil Star S., Gr.3, Martha Cove Cup H., 4th VRC Thoroughbred Breeders S., Gr.3, MVRC Champagne S., Gr.3. Producer. Wealthy (g Danehill) 7 wins at 1400m, 1600m, HK$5,437,500, HKJC Lek Yuen H., Makarpura Star H., Audemars Piguet Lady Royal Oak H., Pok Oi Cup H., HKU Alumni Association Challenge Cup, Norfolk H., Palm H., 2d HKJC Changchun H., Sa Sa Ladies' Purse H., Caroline Hill H., 3d HKJC Centenary Vase, L, Co-Tack H., 4th HKJC Cathay Pacific International Mile Trial, L.
Maayaat (f Sebring) 2 wins at 1400m, 1600m, R183,000, Turffontein Thank You for Your Patronage H., 2d Turffontein Syringa H., L, Vaal Classic Day 28 March H., 3d Vaal Racing. It's a Rush H.
SCHUBERT (g Salieri) 6 wins-1 at 2-from 1000m to 1600m, A$417,750, HK$4,596,662, MVRC Bill Stutt S., Gr.2, VRC Talindert H., L, VATC Vain S., L, HKJC Chinese Club Challenge Cup, L, Sprint Trial Trophy, Together Cup, 2d VATC Caulfield Guineas, Gr.1, SAJC Dermody S., Gr.3, 3d VRC Ascot Vale S., Gr.2, MVRC Alister Clark S., Gr.2, VATC Zeditave S., L, HKJC Sha Tin Futurity Trophy, L, Hong Kong Classic Trial, L, 4th VATC Blue Diamond S., Gr.1, HKJC Chairman's Prize, L, Happy Valley Trophy, L.
DOWNHILL RACER (f Danehill Dancer) 2 wins at 2, A$142,540, STC Magic Night S., Gr.2, MRC Andelosia 2YO P., 2d VRC Seppelt Wines Sprint H., L. Producer. RECAST (c Thunder Gulch) Champion 3YO in Singapore/Malaysia in 2004. Champion Older Male Miler in Singapore in 2008. 11 wins-2 at 2-from 1200m to 2200m, A$30,550, S$2,353,415, 12,144Dhs in Aust. and Singapore, Singapore TC 3YO Challenge (1st Leg), L, Singapore Guineas, L, Kranji Mile, L, EW Barker Trophy, L, Committee's Prize, L, Singapore Gold Cup, L, 2d Singapore Airlines International Cup, Gr.1, Singapore TC Jumbo Jet Trophy, L. Sire. GONSKI (c Danehill) 2 wins-1 at 2-at 1100m, 1400m, A$185,630, VRC Poseidon S., L, STC Erect Safe Scaffolding 2YO H., 2d STC Heritage S., L, 3d MRC WJ Adams S., L, 4th MRC Caulfield Guineas, Gr.1. Sire.